Women with Li-Fraumeni Syndrome have close to 100% chance of developing cancer in their lifetime. About half of all these cancers develop before age 30 and about 50% of the risk is due to breast cancer. The risk of breast cancer by age 60 for women is 85%. So, what’s a lady mutant to do? Women with LFS tend to get breast cancer earlier than the normal population. The cancer risk in general is higher for certain cancers at certain age ranges. Just as one size jeans don’t fit everyone, neither do our genes- even within the same family. We do look at family history for trends, but we are all unique and rare and often our cancers are too. It’s important to not only do monthly self breast exams, but self exams. Know your body, what works and makes you feel your best and what doesn’t. Have any changes checked out by a professional. We usually follow a 2 week rule for lumps, bumps, and weirdisms- if it hasn’t resolved or gotten better in 2 weeks, it’s time to have a doctor take a look and go from there. Ignoring it doesn’t make it go away. We grow weird, not all of it is cancer. Just as you know what jeans feel the best, you know your body. If things are off or don’t feel right, it’s time to call and get an opinion of a clinician. LFS is rare. You are even more rare. You get to make the calls on how you live YOUR best life. You get to make the calls about screening, about treatment, about your health. There are so many tough decisions in life, even tougher ones in dealing with Li-Fraumeni Syndrome. What to eat? How to avoid radiation? Should I have children? Should I have my children tested? What is that lump? Learn as much as you can. Learn from doctors. Learn from reading. Learn from others. Learn about LFS. Learn about nutrition and radiation. Learn about cancer. Then tuck that knowledge away and hope you won’t need it and LIVE. Learn by living. For You. There are many things we do not have any control over, but we can control us. We can’t control our feelings, we can control how we react to them. We can’t control IF we get cancer, but we CAN control how we navigate our risk. If the recommended screening is too much and adds too much stress to your life, finances, and sanity- talk with your provider. There are options. There is support. Find your Tribe. Sometimes you can feel like you are on an island called LFS. You take trips to normal, but often are yanked back by screening, scanxiety, cancer. You are not alone. You are strong. Look at finding support as prophylactic action to prevent insanity. 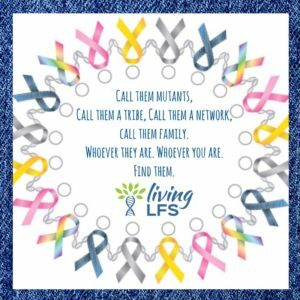 Your Tribe does not have to be LFS related(if you are looking for LFS support- please check out our support groups on Facebook. They are simply amazing). Find Support Here. Find what and who works for you. The majority of our support groups are women. This represents not only the cancer risk associated with LFS in women, but how people deal differently. Although there are different risks associated with gender, coping is not age, gender, or cancer specific. Neither is living LFS. Fannie learned some very powerful lessons from her mother through her breast cancer battles. She learned about self awareness, how to advocate and how she chooses to live despite living with LFS. Thank you Fannie for sharing your memories of your mother and her strength with us. 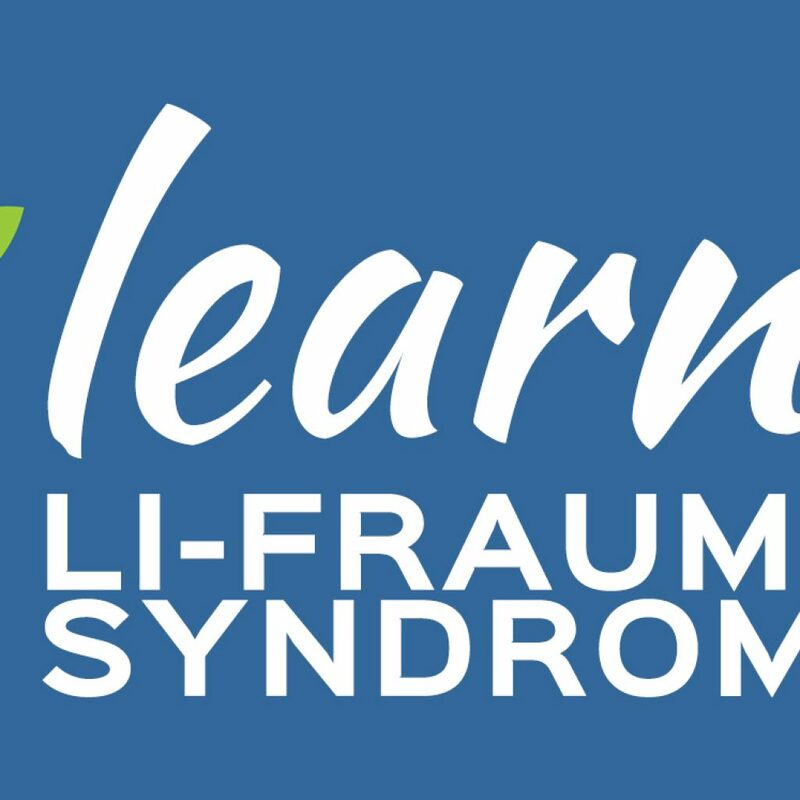 My mom never knew she had Li-Fraumeni Syndrome. I was the first one to get genetic testing done. Fannie’s mom. One of her favorite pictures of how she lived. My mom died of breast cancer when I was 21 years old; she was 45. She fought a great 10 year battle. Four times she had breast cancer. She just thought she was the unluckiest person in the world. But then again her family was almost all gone, killed by different cancers. All pretty young too. My mom always said it was important to know your body. She touched herself a lot(not in a weird way) and encouraged us to do the same. So when she felt a little lump in her left breast, she knew it hadn’t been there for a long time. She got worried and off to the doctor she went. I’m not sure how diagnosis worked back then, I think now doctors are way more aware that breast cancer can hit you pretty much at any age. Her doctor simply told her not to worry about it, that it was probably calcifications and to come and see him in six months. That doctor had no idea what he was getting himself into. My mom wanted a biopsy and she wanted it ASAP. The poor doctor started to argue with her that it was really overkill and that she should wait. My mom told him in no uncertain terms that she would handcuff herself to his desk and call the media if he didn’t arrange the biopsy right then and there. The doctor finally agreed and scheduled the biopsy with the proper department. That’s how my mom discovered for the first time she had breast cancer. Sadly, I remember very little about my mom’s journey through her illness. I was young. I didn’t grasp what cancer could do. After all, breast cancer was an “easy” cancer, right? That’s what they told us anyway. I was also out of the house for her last two breast cancers, the harder ones. I remember one thing about my mom’s fight with cancer: her self- advocacy. Did those six months change anything? We’ll never know. I like to think that her tenacity to get the biopsy allowed her to see her 5 year old daughter grow to the age of 15. Mostly, I think it allowed her to start her Li-Fraumeni journey with confidence and a sense of power over what was happening to her. Cancer can be so scary, being confident and self aware can greatly help one heal. My mom cried very little during her fight against cancer. I like to think that it was because she felt strong and at peace with what was happening to her. After 10 years of off and on battle, my mom decided she was done with all of it: the chemo, the doctors, and the hurting. She finished her journey like she had started it-in control. She made the transition beautiful for us. She found an amazing hospice house where all the nurses and doctors could be qualified as angels. And she went, pretty peacefully. She left me, the only heir of her mutation with the strength to fight for what I want and the power to not let cancer rule my life. She was happy, even in turmoil. I wish to be happy too.